After two months on the job, Secretary of the Army Eric K. Fanning said a key part of his position is making the Army seem more than numbers. One of the top dangers facing the Army is budget uncertainty, Fanning said, voicing a similar concern raised by other Army leaders. Without knowing how much money the Army will have two years from now, it is “very hard to put together a plan,” he said, and that is cheating the taxpayers. Fanning raised three main areas of concern: taking care of soldiers and their families, dealing with emerging threats and acquisition reform. 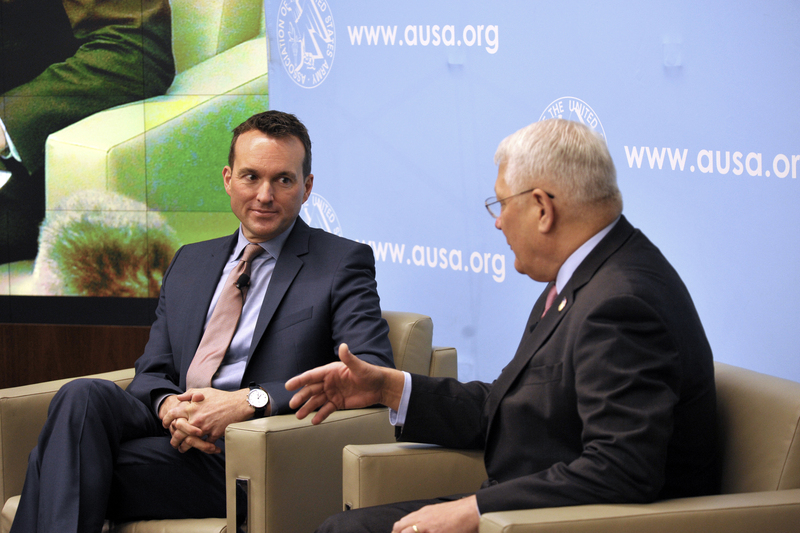 “My primary focus is based on resilience, making sure our soldiers can do what is asked of them,” Fanning said at the breakfast, which was held at the AUSA Conference and Event Center in Arlington, Virginia. One critical issue is sexual assault, Fanning said. Another critical personnel concern for the Army is suicide prevention, a “very difficult issue to crack,” Fanning said. Fanning also wants to figure out how to reduce the stigma associated with mental health treatment among soldiers. “To me, it’s a sign of strength anytime people realize they need help and seek help,” he said. The Army’s hopes for getting the newest and best gear into the hands of warfighters may depend on eliminating layers of acquisition bureaucracy, Fanning said. The Army is “not fielding capabilities as fast as we should” and is spending too much on bureaucratic processes rather than actual resources, he said. Sen. John McCain, R-Ariz., chairman of the Senate Armed Services Committee, shares that view. He included language in the fiscal 2016 National Defense Authorization Act intended to give Army Chief of Staff Gen. Mark A. Milley and his fellow service chiefs a larger role in acquisition decisions for their respective services. “The military used to lead the way on a lot of technological development” like GPS and stealthy weapons, Fanning said. The Army cannot do what the nation asks of it unless the Regular Army, Army National Guard and Army reserve components operate effectively as a wholly integrated Total Force, Fanning said. The multinational Anakonda 2016 exercise in Europe in mid-June that involved U.S. active, guard and reserve soldiers was a perfect example, Fanning said. Spc. Frank Gully, a chemical operations specialist from the 44th Chemical Battalion of the Illinois National Guard, demonstrates his unit’s equipment to Polish soldiers from the 5th Chemical Regiment during Exercise Anakonda 2016. He said his sense is that people join the guard and reserve for different reasons now than they did 20 or 30 years ago. “They want to deploy, they want to be operational,” he said, though he acknowledged that this operational zeal may sometimes create issues for civilian employers. “What I would say is, support us as much as you can, but be as honest with us as you can about where the stress points are,” Fanning said.